The second pitch of The Sting is one of those old-school 5.9+ pitches that will get your attention with tricky, hard climbing and a scary traverse left to a mantel. A long undercling traverse pitch above and a thin, technical crack, leads to a huge runout on relatively easy slab (or an escape right). 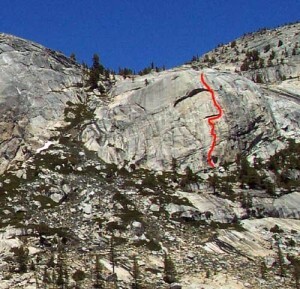 Stingwink, a great linkup, starts by climbing The Sting, then instead of heading up the final runout slab, traverse the roof and finish on the final two pitches of Hoodwink. Which SuperTopo guidebooks include a topo for The Sting?